Bonito: The bonito (beautiful in Spanish) or little tunny is the middle brother of the tuna family. Often ignored because of poor table quality, these fish are truly a gamefish. For anglers looking for pure sport, the bonito can be the answer. Once located, the bonito can bite fast and furious allowing the angler to catch fish until their arms get tired. Much like their cousin the blackfin tuna, a bonito will fight until it is out of the water. Even then, the tail will still be motoring. Bonito Fishing Tips: The bonito is one of those fish that can be caught by many fishing methods. 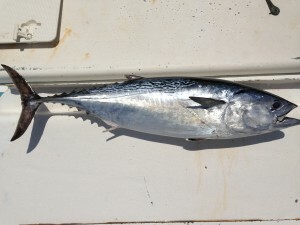 Like many other fish on this list, bonito are commonly caught while live baiting, both inshore and offshore. They are also caught while trolling. Sometimes, they will even attack a bait plummeting to the bottom. Other times, they can be sight casted with live bait and artificials.